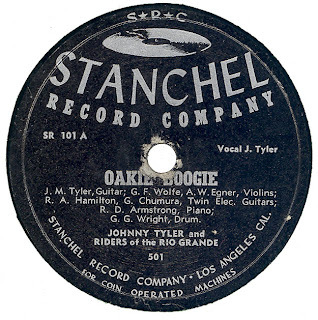 “Oakie Boogie” was also released on MEMO 3020 and BIXBY WM 500. “Troubles On Your Mind” was also released on MEMO 3020 and BIXBY WM 500. “That Wicked Look In Your Eye” was also issued on MEMO 3023. “I’m Gonna Tie My Baby (To A Hitchin’ Post)” was also issued on BIXBY WM 501. “I’m Tellin’ You” was also issued on MEMO 3023 and BIXBY WM 501. “Swenska Schottish” [sic] was also issued on MEMO 3024. "Pecos Polka" was also issued on MEMO 3024. STANCHEL 101 was reviewed in BILLBOARD 6th July 1946. STANCHEL 102 was reviewed in BILLBOARD 6th July 1946. DOYLE AND NORMA "THE MUSICAL HARTS"